Perfect for any celebration, this macaroon layer cake is chewy and moist. 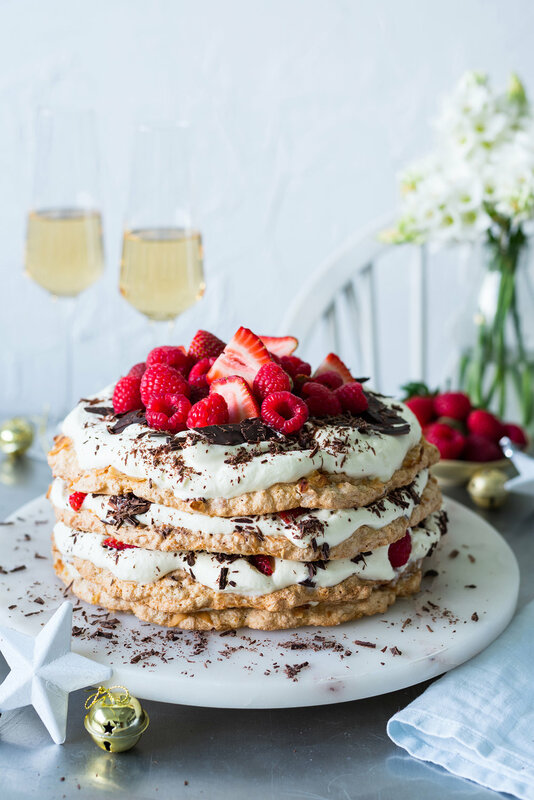 Layered with whipped cream, shards of dark chocolate and fresh berries. This is a great alternative to pavlova and requires much less fuss. Macaroon layers can be made a day in advance, keep in an airtight container until you're ready to serve. Preheat the oven to 155ºC. In a large sauté pan over a medium heat, dry fry both the coconut chips and desiccated coconut until golden. Remove from heat and place in a large bowl with the icing sugar, ground almonds and salt. Beat the egg whites until fluffy and soft peaks are beginning to form. Gradually add the sugar and beat until glossy. Using a spatula, gently fold through the coconut mixture, being careful not to beat out the air. Using a pencil, draw a circle approximately 20cm in diameter onto 4 sheets of baking paper. Flip them over and place on baking trays. Evenly distribute the macaroon batter between the 4 baking sheets being careful to keep inside the pencil lines. Use the back of a spoon to push the batter around and level. Scatter over extra coconut chips. Bake macaroons for 20 minutes or until golden and centre is firm when gently touched. Once cooled, use a spatula to gently seperate the macaroon from the baking paper. Place the cream, icing sugar and vanilla bean seeds in a large bowl. Whisk until soft peaks form. Spread a quarter of the cream over the top of the base macaroon. Make sure you construct it on the cake stand you plan to serve it on, it will be very hard to move once put together. Scatter over a handful of strawberries, a few raspberries and a generous handful of chocolate shavings. Carefully place the next macaroon layer on top and repeat above steps with remaining layers.